6" - 14" Diameters. Abrasive nylon is excellent for light deburring, edge blending and general surface finishing. 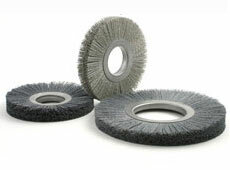 Nylon abrasive power brushes are safe, non-reactive and offer an excellent alternative to traditional steel filament brushes for extrusion cut-off burrs and mount on most pedestal grinders. Please consult the abrasive filament chart for other grits and abrasive types for these nylon abrasive brushes.